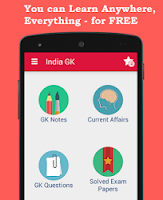 16, 17, 18 January 2018 Current Affairs MCQs, Quiz, Questions: Current Affairs for January 2018, Daily Multiple Choice Questions (MCQs) for India GK, World GK and current affairs with Collection of daily objective type Question by www.Indiagk.net based on General Knowledge (GK) and General Science (GS) Questions for UPSC, State PSC, SSC, Police exam, Railway exam, SBI, Bank PO, IBPC, SSC, LDC, UDC, Army, Airforce, Navy, Coast Guard, Bank Clerk, TET and all entrance examination with current affairs News, Multiple Choice Questions (MCQs) available on Website www.IndiaGK.net and Android Apps with daily updates:. Prime Minister Narendra Modi on 16 January 2018 launched the commencement of work for petroleum refinery in which state? N. Vembusamy Sankaran, the renowned journalist and theatre personality has passed away. He hailed from which state? PM modi has dedicated iCREATE facility to the nation. This facility is located in which state? As per new norms all public transport vehicles should have GPS and an alert button mandatorily from which date? Government declare year 2018 as the ‘National Year of Millets’. This decision has been taken following a request by which state?